All 19 new United States citizens stand and take the Oath of Allegiance. 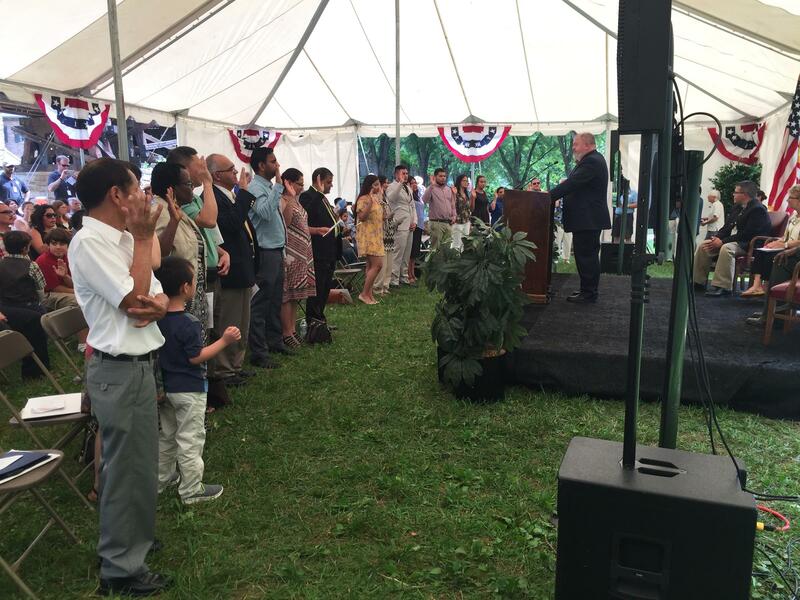 The Harpers Ferry National Historical Park played host to a naturalization ceremony Tuesday morning for 19 new U.S. citizens. About 50 people attended the ceremony celebrating the new U.S.—and West Virginia—citizens. Jose Luis Gil Zambrano – an adjunct math professor at Shepherd University – was one of those nineteen. He and his wife moved to the United States from Venezuela about seven years ago to be near their son who lives in Virginia, but they chose to live in Martinsburg because he says it felt more like home. “I like this place, you know, when I talk about this state, I feel very happy, because, I don’t know, I mean, I feel the people here are very warm,” Zambrano said. The other 18 new citizens originate from 9 other countries, including Bangladesh, India, Liberia, and Mexico. Harpers Ferry National Historical Park has hosted naturalization ceremonies since 2013. The United States Citizenship and Immigration Services says they welcome over 750,000 new citizens to the U.S. each year.